At Royal Brunei Airlines, your health, safety and comfort is of prime importance to us. 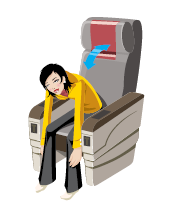 For your general well-being onboard our flights, we would recommend the basic inflight exercises. While seated, raise one foot and draw a circle with your toes. Rotate clockwise for 15 seconds and repeat the same counterclockwise. Repeat with the other foot. You can do one foot at a time or both simultaneously. Lift and hug your knee to your chest as close as you can. Hold for 15 seconds. Alternate knee. Repeat 10-15 times for each knee. Relax shoulders then hunch them forward. Rotate gently 10-15 times. Stretch hands forward, then pull back slowly as far as possible. Repeat 10-15 times. There are currently no comments on STAYING FIT. Perhaps you would like to add one of your own?